Republican congressional hopeful Pete Stauber says that his Democratic opponent's support for a $2 billion tax hike could cost him in the midterm elections. 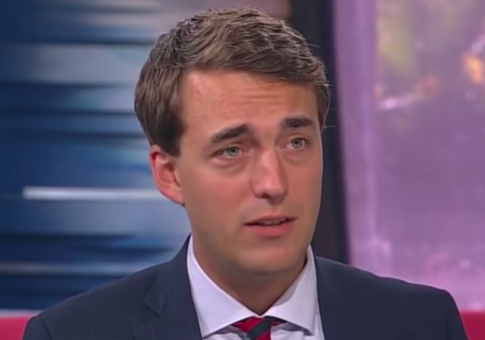 Democratic nominee Joe Radinovich doubled down on his support for tax hikes passed during his single term in the Minnesota House of Representatives at the final debate in Minnesota's Eighth Congressional District. Stauber, a St. Louis County commissioner, defended President Trump's tax cuts during the debate hosted by Minnesota Public Radio, while Radinovich countered that they would drive up the deficit. "Joe, it's interesting you want to be a fiscal hawk when you voted for a $2 billion tax increase for the state of Minnesota, so it's kind of hypocritical for you to stand here," Stauber said before Radinovich cut in. "You're darn right I voted for that," the Democrat responded. "You're going to accuse me of raising taxes by $2 billion dollars? I am guilty as charged," he also said in the debate. Stauber has since made the comments at the October 26 debate a centerpiece of his campaign to replace Radinovich's former boss, outgoing Democratic representative Rick Nolan. The former police officer told the Washington Free Beacon that the average family in the eighth district, a largely middle class mining hub centered around the city of Duluth, will receive a $2,500 increase in their take home pay thanks to tax reform. "Our economy is just starting to recover and my opponent comes back with the old, tired arguments about the rich versus the poor," Stauber said in a phone interview. "That doesn't play well here." Radinovich served as Nolan's campaign manager in 2016 shortly after he was ousted from office following a single term in the Minnesota House of Representatives. Stauber said boasting about tax increases in a region that has suffered from deindustrialization and the loss of manufacturing and mining jobs is "exactly why the voters threw him out." While Nolan narrowly won reelection to Congress in 2016, Trump won the district by double digits, making the eighth district a key target for Republicans looking to maintain control of the House of Representatives. Stauber said Radinovich has lived out an old playbook on tax hikes that no longer appeals to voters. The Democratic-Farmer-Labor Party "has left northern Minnesota and they left a while ago. It is now run by Minneapolis liberals," Stauber said. "We are a hardworking, blue collar, common sense district—our voters want to keep more of the money they earn." The Radinovich campaign did not return request for comment. Stauber trailed Radinovich by 1 point in a September New York Times poll. The same poll found the Republican up 15 by October, leading the Democratic Congressional Campaign Committee to withdraw advertising spending and reallocate to other races in the state. This entry was posted in Politics and tagged 2018 Election, Minnesota, Tax Hikes. Bookmark the permalink.